If Polar Bears Can Eat A Ton Of Fat And Be Healthy, Why Can't We? : Shots - Health News Baby polar bears slurp milk that's 27 percent fat, and adults dine on seal blubber. Scientists think bears' adaptation to a high-fat diet might lead to better ways to treat human obesity. If you were a bear and wanted to make a go of it in the frozen North (think polar bear, of course), what would you need to survive? White fur would help, to help you sneak up on prey. Also plenty of body fat to stay warm. And you'd need great stamina to swim many miles from one ice floe to the next. And there's another important trait, researchers reported Thursday: Polar bears have genes that help them live on a diet that's overloaded with fat — without suffering the sorts of human diseases that typically come with a diet of that sort. The study notes that a baby polar bear drinks milk that's 27 percent fat (forget the 2 percent we get from the carton). Adults feed mostly on blubbery seals. And that allows them to build up so much insulation that bears can be 50 percent fat by weight. Yet you never hear of a polar bear being rushed to the hospital with a heart attack. More to the point, it's unlikely that polar bears could survive as a species if they hadn't developed an ability to live on a high-fat diet. Researchers reporting in the journal Cell say they've found clues in the genes of polar bears. The international team has taken a close look at the polar bear genome to understand how this species split off from its close cousin, the brown bear. As you would expect, they find that the genes related to fur color have mutated. In fact, the changes occur in a genetic region that's linked to a human condition called Chediak-Higashi syndrome, which causes loss of pigment in the skin and eyes. But the genes that seem to be key to polar bear evolution are those involving how these animals handle their fatty diet. To cite just one example, a gene called VCL is linked to heart disease in humans. 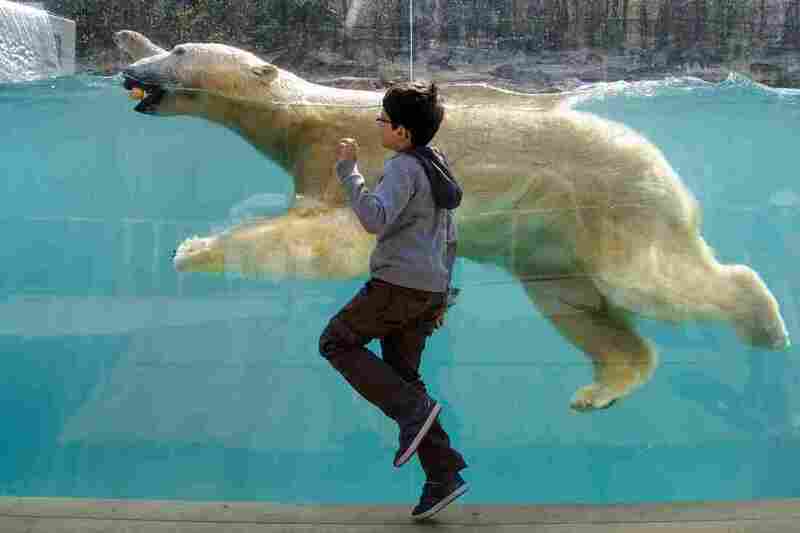 But in polar bears, this gene has undergone a dramatic evolution, compared with the VCL gene in the brown bear. We could keep on going down the alphabet-soup list of genes, but you get the idea. "Based on this evidence, we argue that potentially important reorganization of the cardiovascular system has taken place in polar bears since their divergence from brown bears," the authors write. The genes in question might not simply help bears pack on the pounds without ill effect; the rapid genetic changes might also have been driven by the long-distance swimming that polar bears do. Bears that have cardiovascular genes that help endurance are presumably at an advantage, so those genes are more likely to be passed on to future generations. Exactly what this means for human health isn't clear. Yes, there are hints about genetic traits that make bears less susceptible to heart disease. But we aren't bears. That said, the authors note: "It certainly encourages a move beyond the standard [rodents used in research] in our search for the underlying genetic causes of human cardiovascular diseases." They don't have direct evidence that these genes help the polar bears, according to Rasmus Nielsen, an evolutionary geneticist at the University of California, Berkeley who led the study. "It's not the kind of animal you can take into the lab and do experiments on," he told Shots. Instead, they're hoping to take some of the polar bear genes and some of the brown bear genes and swap them into mice, to see what effect they have on their cardiovascular systems. Oh, one last thing. This paper suggests that polar bears evolved quite recently — just 400,000 years ago. That may prove to be contentious. Another recent study puts the split between brown bears and polar bears at 4 million to 5 million years ago. Nielsen hopes his more detailed study has settled the matter, but Charlotte Lindqvist, an assistant professor at the University of Buffalo and author of that 2012 study, told me later by email: "I am quite sure this is not the last word about the time of origin for the polar bear."